The depression was hardly the right time for anything startlingly different, yet this “car of the future” should have been a sales smash. Ironically, it almost was. Everybody thought it was great, except the buying public. Although years ahead of its time, its extreme styling hurt sales of the Airflow. 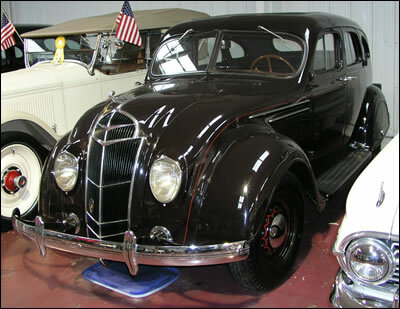 Following the most modern concepts of automotive and aviation design, Airflow bodies were constructed around a cage-like steel girder network, to which the body panels were welded. The body and chassis were one integral unit, making the Airflow the forerunner of today’s unit body construction. The unit body was so strong, that in a widely reported publicity stunt, an Airflow was driven off a 100 foot cliff, bounced down the cliff face, landed on all four wheels, then promptly driven off under its own power.